We'd asked you, dear readers, to share your crazy, fun Veere stories. 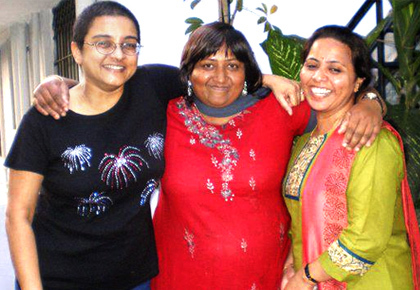 Rediff reader Heera Nawaz, 57, talks about her favourite girl gang. 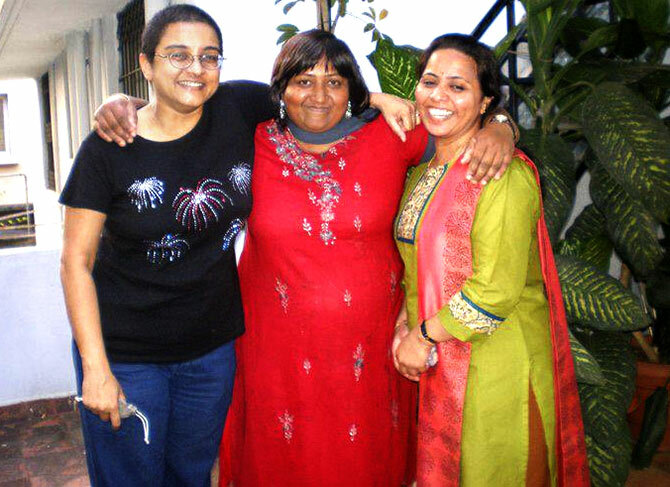 (LtoR) Nazneen Tonse, aged 51; Heera Nawaz, 57 and Babitha Kathare, 51. Like the protagonists in the movie Veere Di Wedding, the only thing common in my all-girl gang is that we, too, are commitment phobic. I mean, Nazu and Babitha could have guys lining up until the next street corner should they opt to get married. But they, like me, have been influenced by the countless negativity that marriage seems to spew forth, and therefore, opted to stay single. That doesn't mean we don't have fun. Every New Year's Eve, Valentine's Day and on Eid, we 'Three Female Musketeers', get together. We let out hair down and have a whale of a time. This photograph (above) was taken shortly before New Year when Nazu's father was getting on in years and Babitha and me wanted to pay our last respects to him. Our hunches were right. That was the last day we saw him. Before Eid last year, Nazu drew the most beautiful intricate mehendi on our hands, like it is usually done during weddings. We patiently waited for it to dry. This year, ahead of Valentine's Day, we did something really bizarre. Babitha managed to bring her brother's babies to Nazu's house, and all three of us played with them. Who says that only boys have all the fun? Not when you have a girl-gang like mine. What's the craziest thing/s you've done with your girl gang? It could a truth-or-dare game that went all wrong or a surprise birthday bash you had the most fun at. Did you binge watch your favourite TV show in pajamas all day? Or shopped till you fainted at an exciting garage sale? We want you to tell us all about it. E-mail your stories to getahead@rediff.co.in (subject: My Veere Story) along with your NAME, AGE, LOCATION and photographs of your girl gang. What's your Veere story? Tell us! Why do girls have all the fun?